A sweet friend from MOPS shared this recipe with me and I fell in LOVE. 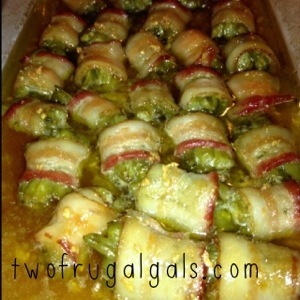 It’s a fabulous recipe used as a side dish or appetizer and works great prepared in advance. 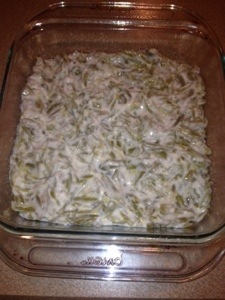 It’s also a great recipe this time of year because you can find fresh green beans on sale! 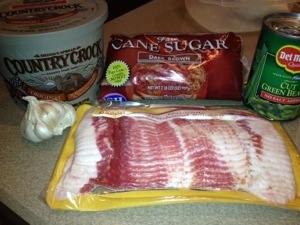 Cut each strip of bacon into 2 or 3 even pieces, depending on length of bacon. Spread each piece with your finger to thin and stretch it slightly. Take 5 or 6 whole green beans and place them in the center of each bacon piece, them roll bacon around beans and put seam side down in a single layer in the bottom of a greased casserole dish. In a small saucepan, mix together brown sugar, butter, and garlic; bring to slight boil. (Can also do this in the microwave.) Drizzle over bundles. Bake at 350 degrees for 30 minutes. Seriously, my mouth is watering just looking at this picture! Bacon for life!